I must've picked up a thorn on the warmup. Did I mention I'm on a tubular, so I can't just put a tube in? It's going to be ok though, Adam has spare wheels in the car. Jump out of the start grid and rush to the car. We had a guy driving it to the finish line, and apparently he's already gone. While I'm looking in shock at the parking space where the car should be, the gun fires and wave 1 leaves. I start scouring the parking lot. There's 1500 people in the race. Gotta be 300 at least on cross bikes. Someone will have a wheel I can use. No one has a wheel. After 15 minutes of riding around, wave 2 has left and wave 3 is staged. No one is left in the parking area(s). Forget racing, I've gotta find a way to get to the finish line before this place is a ghost town. And right as I gave up, I found the car. It wasn't taken, just moved so it could be taken later. In the back of the car is a spare clincher wheel with a road slick on it, and an unmounted Grifo clincher tire. I'm already 15 minutes down, so what's another 5? As I finish changing the tire, wave 3 goes off, putting me a cool 20 minutes behind where I thought I was going to start the race. Doesn't matter, because a second ago I didn't think I was going to get to ride at all. So rolling through the start line as they're taking it down is still a million times better than a nine hour drive to NOT RACE YOUR BIKE. 60k time trial? Let's do this. It took me a few minutes to catch the back of wave three. For a minute we were on a dirt road, and passing was feasible, if not easy -- but soon the trail become a two-lane rail trail and it's total gridlock. I'm still just happy to be riding, though, so I can roll with it. I kept the sketchy passes to a minimum and spent a lot of time coasting behind people on ancient mountain bikes. Every once in a while, a gap would open and I'd shoot into it, accelerate to 25 mph, and then slam on the brakes as I caught the next group. After 20 minutes of this, we hit the first steep hill, which I somehow cleaned through hordes of people walking. Over the top I was breathing hard for the first time all day, and I realized something: I was having a lot of fun. To be fair, starting a race at the absolute back is a good way to stroke your ego. And if I didn't want to stroke my ego, then why do I have a blog? Exactly. So we get to a road section, finally, and I'm like HEY TOURISTS, CHECK OUT MY WATTAGE. They don't care, but I can't tell because I'm riding at pretty much double everyone else's speed. The speed differential is borderline dangerous as I weave through crowds on the road. Then... a left turn into some singletrack, and I'm blocked again. But it's ok, because mandatory recovery time just means I'm gonna ride that much harder on the next road section. I'm in a foreign country, with a carbon wheel that goes *ping* when I shift, there's a raging tailwind, and I'm spinning out the 44x12 on flat ground passing an average of 10 people per minute for two hours. If you can't enjoy pointlessly drilling it under those conditions, then you might want to take up knitting. So that was the pattern. I literally passed ~1200 people during the race in two hours. 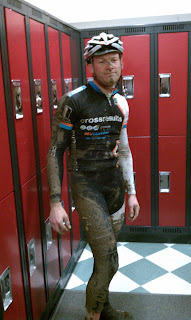 Every time it was singletrack, I was blocked, but every time it was wider, I was just effing flying through the crowds. Finally after 90 minutes I started to think that I would be ok with the race being over. There are some mud chutes on the course, where the trail would drop straight down a drainage full of a mud for several hundred yards. Apparently these are always wet; this year, they were full of thick, deep mud, so deep you had to pedal pretty hard downhill just to move. Many people were walking them. With 4k to go, I made it to "Powerline Mud Chute," which looked just like every other chute -- a river of ankle-deep footprints in mud down through the trees. Everyone in sight was walking. Dudes, I didn't drive nine hours to walk. So I'm pedaling hard down the hill and drifting through walkers and generally thinking about how epictacular this is (did I mention it was snowing sideways at this point?) when I notice a spot with very few footprints that I'm headed directly toward, and there also happens to be a bunch of spectators with cameras next to it. The landing was very soft and very wet. 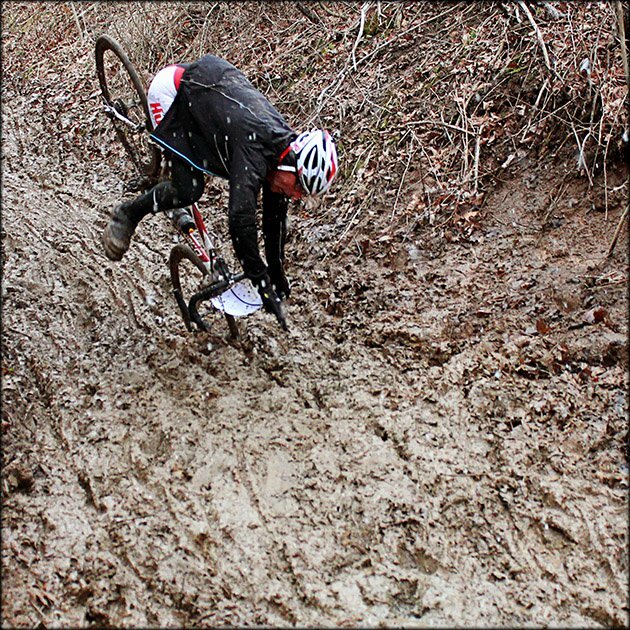 I was high on adrenaline, so I started screaming at the spectators about how sick that crash was while I tried to free my bike from the mud. I nearly lost a shoe in the process but eventually made it out with all my equipment. After ten seconds of running, I remembered that GETTING RAD was priority #1, so I remounted and rode ten more seconds of slop before crashing again. On the third try, I stuck it all the way to the end of the chute, where we turned onto a dirt road, the snow changed to rain, and I realized that I was very, very muddy and very, very ready to be done racing bikes. And ten minutes later I was! I ended up "salvaging" a 321st-place finish with a time of 2:29; take away the 22 minutes of nonsense and I'd be 107th; take away another 10 minutes for being stuck in traffic and having no one to draft, ever, and I'd be 44th; take away the fact that I'm not a pro bike racer and I'd easily have been top 5. I'm just sayin'. But none of that really matters. The race was unique, the conditions were epic, there was pavement, dirt, mud and trail and it was the perfect event for racing on cross bikes. Like Adam said, this was what a lot of people are looking for when they go to Battenkill -- an epic off-road adventure where the number next to your name of the results is less important than the experience. That being said, I'll be back next year with a chip on my shoulder and a Vittoria pit stop in my pocket. Bar cam coming later in the week! hey tourist, check out my wattage. Agree with Faticus. Some 'Charlie Sheen level' winning lines in this post. Nice work. You're like America's Funniest Home Videos, you keep getting kicked in the nuts, and e keep laughing.